Truckfighters/Firestone - "Fuzz Split of the Century"
Well, this is the first record I have received in 2004 on a brand new label and two new Swedish acts I have never heard either. 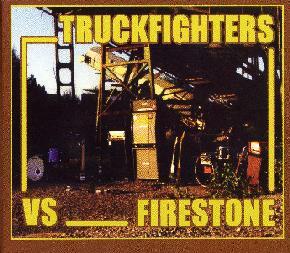 The CD starts off with the Truckfighters (www.truckfighters.cjb.net), a four piece (two guitars, bass, vocals and drums). The band has recorded 3 previous demo CDs between 2001-2003. All the tracks here are new. The opening number, "The Special Theory Of Relativity" is an instrumental piece with a very special drum sound. Interestingly, the press info says the drums were recorded in a big sports hall! Special Theory is a slow groovy spacey stoner piece with plenty of fuzz and it leads straight into "Nitro", which lays down a thick groove with distant and distorted vocals placed in the back of the thick layers of fuzz and guts? "Helium 28" has a cool groovy guitar riff before it gets buried by the pummeling bass, but slowly the tune takes off into more melodic territory including an ending with birds and acoustic guitars and harmony vocals, quite cool. "New Woman" begins with pounding bass drum as the riff is slowly layered into the loose building groove. Back to pummel you again. Their portion of the CD ends with "Valium" (which is replaced on the vinyl version with "Gravity x-3"), a cool 9 minute track. This is as close as the band get to reaching the space-fuzz-rock heavens. Guitar solos are few if at all on these tracks with the band rather relying on heavy riffs to try to take you into space. Sometimes they succeed, sometimes not. Pretty cool stuff. That sets the stage for Firestone (www.firestonemusic.com) who have been around since 1999 and released two EP's and toured around in Sweden and Finland. While Truckfighters go for some longer tunes, all the Firestone tunes are in the 3 minute range, short and potent but plenty of fuzz and distortion. "Code to Destroy" is the first track and while the riff is very Sabbath inspired the vocal delivery gives the tune a Blue Cheer like feel. This band also is not into guitar solos and pretty much purely riff rock. "Megalomania" is next and again really grooving stuff. Whereas with Truckfighters you can never really figure out the singer, Firestone bring down the grooves and you can hear the nice vocal delivery of Mattias, who clearly likes his John Garcia. "Planet Remover" is another melodic Kyuss like track with a pretty cool break (too short) in the middle with congas, fuzzy wah bass or guitar, it is hard to tell for sure. The CD ends with "Let the Sky Fall" and reminds me of Unida quite a lot. While Firestone play good quality stuff, it just lacked something for me but I imagine they play some raging live shows. If you love your rock heavy, fuzzed and stoned, then look no further than this release. I can't see how you won't dig it!